The mac and cheese ($11) at Duke's Grocery is made with two types of cheddar cheese and served in a piping hot skillet. 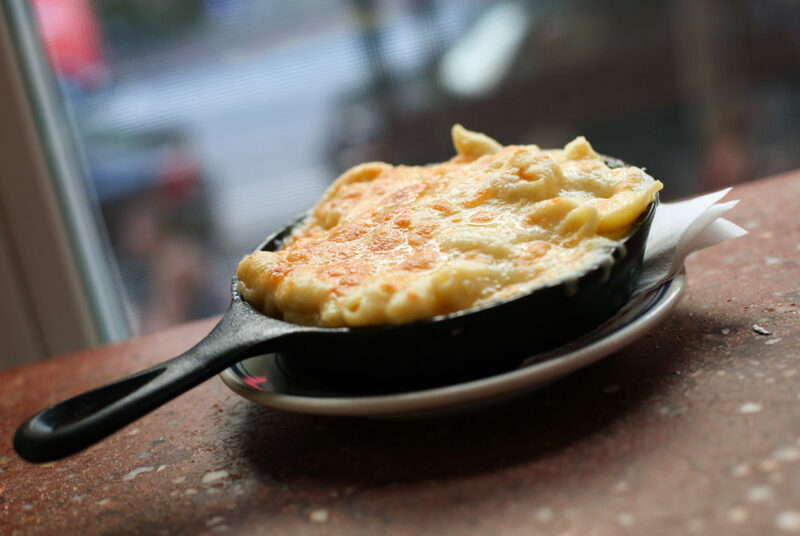 A simple box of mac and cheese is easy to throw together, but Duke’s Grocery in Dupont Circle upgrades the simple dish. Duke’s Grocery, located at 1513 17th St. NW, is a beloved D.C. spot that serves East London inspired cuisine. A second location will open on campus in The Shops at 2000 Penn later this year, but for now, it’s worth the short walk from campus. The restaurant’s industrial yet cozy vibe is aided by the brownstone’s front patio adorned with string lights and communal benches. Inside, two levels with a bar on each floor are accented with homey furniture, exposed brick and counter seating on colorful stools. Duke’s Grocery regularly updates its daily menu based on seasonal availability, but the restaurant has perennial offerings like the infamous proper burger ($13), an angus beef burger topped with melted Gouda, pickles, red onion, sweet chili sauce, arugula and garlic aioli, all piled high on a brioche bun. The spicy aubergine sandwich ($13) – dubbed a sarnie on the menu – comes packed with panko coated eggplant and squash, smoked Gouda and spicy pickled jalapenos topped with a pesto and green chili puree all served between fresh ciabatta. For night owls, a late night dinner menu is available until 1 a.m. Wednesday and Thursday, and until 2 a.m. Friday and Saturday. Weekend brunch is served from 10 a.m. to 3 p.m., where you can order a proper English brekkie ($16) with egg, bacon, banger sausage and all the fixings. The gooey croque madame ($13) is also a delight, served with bacon, tomato jam, garlic aioli, arugula and an egg on sourdough bread. The brunch options hit the spot, but the menu item that will make Duke’s Grocery your new go-to is the truffle mac and cheese ($11). The dish is served in a piping hot skillet and oozes with sharp white and mild cheddar cheese. Each piece of pasta is smothered in cheese, making every bite rich and delicious. The mac and cheese is made with pasta shells, which allows cheddar to melt into the folds of each piece of pasta. The skillet is baked, so the top layer of cheese comes out browned and crispy, adding a difference in texture to the dish and a slight crunch. Tossing in a dash of truffle oil takes this dish to the next level. The oil is typically added to refine a classic dish into something classier, and Duke’s Grocery nails this with its mac and cheese. The oil sharpens the cheddar and adds an unexpected punch to this savory dish. Next time you go to reach for a box of mac and cheese, put it back on the shelf and head to Duke’s Grocery to experience the truffle mac and cheese instead.